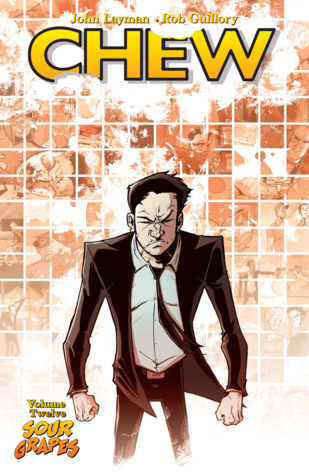 Finally, after a 60 issue run, spanning seven years of the creators' lives, Chew has come to an end. It's been quite a ride! Chew Volume 12: Sour Grapes finally ties up all the loose ends of this bizarre, gruesome, occasionally touching and oddly addictive comic. Savoy tells Tony the secret to saving the world. Tony Chu, FDA agent and one of two living cibopaths (people able to get psychic impressions from the food they eat) is left with the gruesome task of having to eat Mason Savoy, his former mentor. Savoy hasn't made it easy for him. By eating a load of beets (the one food that blocks Tony's powers) before killing himself, he ensures that Tony won't be able to find out what he wants with just a nibble. Instead, he must eat a lot more of Savoy, and is unable to control the flow of the information the meal gives him, allowing Savoy to pontificate at his leisure. This is unfortunate, because Tony, and the rest of the human race, don't have a lot of time to spare. The mysterious fiery alien writing is about to reappear in the sky, and this time it's a countdown. Tony and Amelia, as the countdown begins. Writer, John Layman doesn't pull any punches. We say farewell to several beloved characters and a whole lot of others into the bargain. Honestly, much as I loved this comic, Volume 12 drags on a bit as the creators tried to cram everything they needed to finish up into the last few issues. And the ending? Well... Let's just say it wasn't what I expected. I don't hate it, I'm just a bit "um... what?!" I admire Layman trying something a bit different that was bound to anger the fans, but I'm not sure whether I liked it. Goodbye Chew, it's been real. Not the actual ending, but not a bad moral as morals go.